Tigernuts usually grow along rivers and are often cultivated on a small scale by local farmers mostly in the northern parts of Nigeria. It is known as “aya” in Hausa; “akiawusa” in Igbo; “ofio” in Yoruba . It is also called yellow nut sedge, “souchet” in French, “ermandeln” in German, and “chufa” in Spanish [2,3]. Tigernut is cultivated in Europe, South America and Asia, and Africa. Many varieties are cultivated, but only yellow and brown varieties are readily available in for public consumption. Many preferred yellow variety to others because of its attractive color, bigger size, and fleshier nuts. It also produces more milk upon extraction, contains more proteins, and possesses less anti-nutritional factors like polyphenols and lower fat . Tigernut milk is served as healthy drinks in restaurants as a refreshing beverage (even competing favorably with other soft drinks) in Spain for several years. Unfortunately, it has been underutilized in Nigeria probably due to inadequate knowledge on its potential values . Tigernut can provide a huge market for Africa because many tribes in Africa, often collected and eaten raw, as a vegetable. Its ground flour can be mixed with sorghum to make ice-cream, milky drink and porridge . Tigernut is considered to possess some therapeutic effects [5-7]. Moore coined that good consumption of tigernut milky drinks will significantly lead to healthier cholesterol levels. Belewu and Abodunrin et al., found that tigernut milk is a highly nutritive and energetic drink, high in starch, glucose, and proteins, rich in minerals elements like phosphorous and potassium, as well as in vitamins C and E [5,8]. It equally contains a high amount of oleic acid which can defend the internal mechanisms and prevent constipation, diarrhea and cardiac disorders. Consumption of tigernut milk has not been associated with any form of allergy. Aremu et al., found that tigernut was rich in myristic acid, oleic acid and linoleic acid (Figure 1) . Figure 1: Fresh yellow tigernut. Fresh raw tigernuts (about 10 kg) were collected from Anyigba market in Dekina Local Government Area, Kogi State, Nigeria. All the materials used in the analysis were obtained from biochemistry Laboratory of Kogi State University, Anyigba. Fresh tigernuts were visually inspected and defective ones were manually removed and discarded. Hence, only matured healthy tigernut tubers were selected. Tigernuts were weighed to 500 g, washed thoroughly in two changes of clean water and drained prior to use for the study. The weighed samples were carefully pounded using a mortar and pestle until a very fine consistency was gotten and stored in a refrigerator for further analysis. The proximate composition of fresh tigernuts was determined by the various methods described in AOAC (2010) . Oven method was used to determine the moisture value of tigernut. Crude protein was determined by the Kjeldahl method. Ash content of the sample was determined by the method described in AOAC (2010) . The crude fat content of tigernuts was determine using the Soxhlet fat extraction method. Crude fibre was determined after boiling 5 g defatted sample in refluxing sulphuric acid and sodium hydroxide. Available carbohydrate was determined by difference (subtracting crude protein (%), moisture (%), fat (%), crude fiber (%) and ash (%) contents of the tigernut sample from 100). Minerals: A spectrophotometric method was analysed minerals content of tigernuts as applicable in (AOAC, 2010) . Vitamin A: Vitamin A content of the sample was determined by the spectrophotometric method described by Rutkowsi M .
Ascorbic acid (Vitamin C): Vitamin C content of the sample was determined by spectrometric method coupled with DNPH procedures . 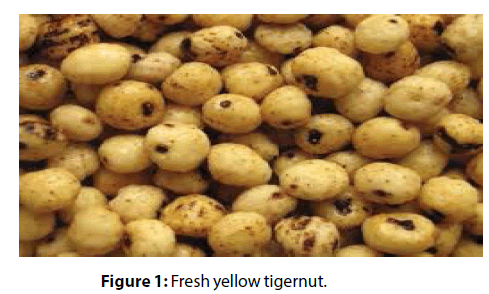 Figure 2 shows the Proximate composition of fresh tigernuts per 100 grams. The moisture content of tigernuts obtained was 42.40%, crude protein 8.51%, ash 1.18%, crude fiber 13.10%, crude fat 17.00%, carbohydrate 17.82%. Figure 2: Proximate composition of tigernuts. 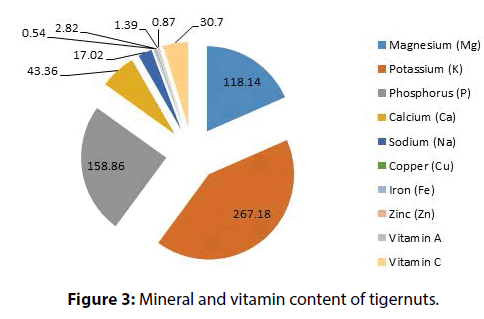 Figure 3 depicts Micronutrient (mineral and vitamin) composition of fresh tigernuts per 100 g. Magnesium (Mg)118.14 mg, Potassium (K) 267.18 mg, Phosphorus (P) 158.86 mg, Calcium (Ca) 43.36 mg, Sodium (Na) 17.02 mg, Copper (Cu) 0.54 mg, Iron (Fe) 2.82 mg and Zinc (Zn) 1.39 mg. The vitamin A value obtained is 0.87 mg and vitamin C30.70 mg per 100 g of sample. Figure 3: Mineral and vitamin content of tigernuts. 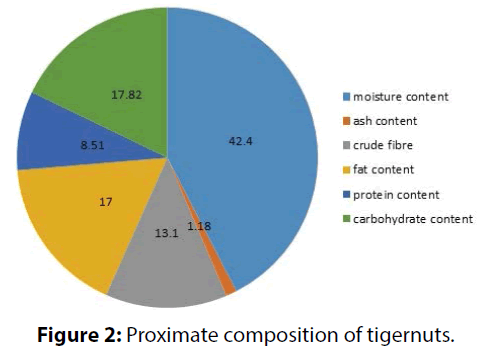 The outcome of the proximate composition of 100 g of tigernuts showed the various components in a decreasing order of moisture, carbohydrate, crude fat, crude fiber, crude protein, and ash contents. This implies that tigernuts are high in moisture, carbohydrate, fat and fiber content. The mineral content of tigernuts in a decreasing order comprised of potassium (k), phosphorus (P), magnesium (Mg), calcium (Ca), sodium (Na), iron (Fe), zinc (Zn), and copper (Cu) respectively. It was also shown to contain a high level of vitamin C and little vitamin A content. They are fairly good sources of protein. Fresh tigernuts are high in moisture content. This indicates that it can perish easily due to microbial attack. Tigernuts could be eaten fresh as snacks by young and old (children, adolescents, and adults, pregnant and lactating mothers) for its high nutrients. These nutrients could significantly contribute to the body’s metabolic processes, refreshing the body as well. Consequently, if 100 g of tigernuts is consumed, it could significantly contribute more than 40 % of carbohydrate to a child’s (4-9 yrs) daily carbohydrate requirement and more than 32 % of carbohydrate to an adult’s daily carbohydrate need . Tigernuts in comparison to other starchy roots and tubers such as sweet potatoes, yam, and cassava, have interestingly, significantly higher fat content and could contribute more than 73% of fat to a child’s daily fat need and more than 49% of fat to an adult daily fat requirement . The fat content of tigernuts are relatively similar to that of nuts and seeds but are higher than that of cereals and compares well with that of soya beans . Tigernut fiber values from the findings are in line with the report of Umerie et al. . In contrast, Temple et al., reported a lower fiber value (5.50%). With about 100 g of tigernuts if consumed, the fibre content could play an important role in the reduction of pressure and transit time of food through the body aiding in digestion . Fibre aids in the alleviation of flatulence problem, thus, tigernut fibre could be explored in formulating diets for treating indigestion, constipation and non- communicable diseases such as colon cancer, diverticulosis, coronary heart disease and obesity . The protein content of tigernuts in this present study is in line with the range reported by Tiger nuts Traders et al. . The Protein content of tigernuts is higher than that of most starchy roots and tuber crops such as cassava, sweet potatoes and yams . Tigernut’s protein content compares well with that of cereals such as rice and sorghum . Tigernuts can be a source of plant protein if it is bio-available. Tigernuts could contribute more than 17% of protein to adult’s daily protein need and more than 26% to a child’s daily protein requirement. About 100 g of tigernuts could provide about 15-22% of the energy required for children per day (4-9 yrs) and 8-16% of daily energy requirement for adolescents, adults and pregnant mothers . The ash content of 100 g of tigernut which was 1.18% fell within the range reported for other starchy roots and tubers such as yam, cassava, and potatoes. Tigernut’s ash value was in line with the reports of Temple et al. . However, values reported by Umerie et al., on tigernuts had significantly higher values (2.48% and 6.70% dry weight, respectively) . Magnesium provides bone strength, aids enzyme, nerve and heart functions. Tigernuts could contribute adequate Mg and Zn (100%) to the daily need of children. Phosphorus enhances quick release of energy in the body and may combine with calcium for bone and teeth development. Tigernuts are relatively low in calcium and sodium. Recent studies on blood pressure showed that a diet rich in potassium and magnesium but low in sodium can lead to a decrease in blood pressure within days of beginning a specific diet . Potassium aids nerve impulse transmission and it is a major cation of intracellular fluid. High potassium to low sodium ratio of tigernuts therefore, may be imperative in diet formulations for patients with high blood pressure and edema as well. Tigernuts contain protective nutrients because it could supply adequate zinc, copper, iron, vitamin C and E. Zinc is an integral part of hormones and more than nearly 100 different enzymes. Zinc is vital in several metabolic reactions and may play an important role in alcohol metabolism, immunity, sexual development, and reproduction. Copper aids in iron metabolism. It works with many antioxidants, enzymes especially those involved in protein metabolism and hormone synthesis. The iron content of tigernuts could contribute to preventing anemia. Fe is the functional component of hemoglobin and other key compounds used in respiration, immune function, and cognitive development. The Fe content in tigernuts (100 g) could be enough to cover the daily minimum needs (providing about 67-68 %) for children. Tigernuts could provide about 27-64% of adolescents or adults daily iron need and 18-49% of pregnant mother’s daily iron needs. If 100 g of tigernuts is eaten per day by children between 4-9 years old, the vitamin C content could be adequate, providing about 88-100% of their recommended dietary intake . Vitamin C is important in collagen, hormone and neurotransmitter synthesis. 100 g of tigernuts could also meet about 77% daily vitamin C needs of adolescents, 69% for adults and 52% for pregnant mothers. Besides, high vitamin C concentration in tigernuts may render soluble the iron content and make it more available . Vitamin C is antioxidants which are important in the prevention of coronary diseases and cancer . The result of the study provides information on the nutritive value of tigernuts. The result showed that they are rich in energy-giving nutrients (carbohydrate and fats) and fairly high in proteins. It is also rich in phosphorus, potassium, magnesium and preventive or protective nutrients (fiber and vitamins C). They contain a moderate amount of calcium which is essential for teeth and bone development, blood clotting and regulation of muscle contraction. It is low in sodium which can lead to a decrease in blood pressure within days of beginning a specific diet. Tigernuts could bring many benefits to people (young and old) in developing countries by playing important roles in providing food security, enhancing livelihoods, improving nutritional status and social well- being of vulnerable groups. Tigernuts and its products such as tiger nut wine, plain tiger nut milk (popularly known as “kununaya” in Hausa can be so refreshing especially when taken chilled) could thus, go a long way to alleviate problems of malnutrition and non-communicable diseases. Musa AA, Hamza A. Comparative analysis of locally prepared ‘KununAya’ (Tigernut milk) consumed by students of Kaduna State University, Kaduna, Nigeria. Sci World J 8: (2014). Odoemelan SA. Chemical composition and functional properties of conophor nut flour (Tetracarpidum conophorum) flour. Int J Food Sci Technol 38: 729-734 (2003). Bamishaiye E. Tigernut: As a plant, its derivatives and benefits. AJFAND 11: 8-14 (2011). Food and Agriculture Organization (FAO). Effect of processing on nutritional value, roots, tubers, plantains and bannanas in human nutrition FAO Corporate document Repository. (2005). Moore M. Documents prepared for bottle green for the product tiger white. (2004). Farre R. Nutritional and dietetic aspects of tigernuts. Food Sci Technol Int 11: 33-40 (2003). Bixquert M. Digestive aspects of tigernuts. Pesca Y Alimentacion 71: 85 (2003). Belewu MA, Abodunrin OA. Preparation of Kunu from unexploited rich food source: tigernut (Cyperus esculentus). World J Dairy Food Sci 1: 19-21 (2006). Aremu MO, Ibrahim H, Aremu SO. Lipid composition of black variety of raw and boiled tigernut (Cyperus esculentus L) grown in North-East Nigeria. Pakistan J Nutr 15: 427-438 (2016). Association of Official Analytical Chemist (AOAC). Official methods of analysis (18th ed.). Washington DC (2010). Rutkowsi M. Modifications of spectrophotometric methods for antioxidative vitamins determination convenient in analytic practice. Acta Sci Pol Technol Aliment 6: 17-28 (2007). Rahman MM, Islam MS, Begun SA. A simple UV-spectrophotometric method for the determination of vitamin c content in various fruits and vegetables at Sylhet Area in Bangladesh. J Biol Sci 6: 388-392 (2006). FAO/WHO/UNU. Human vitamin and mineral requirements (Recommended Dietary Intakes): Report of a joint food and agricultural organization, World Health Organization and United Nations University. (2002). Sanchez-Zapata E, Fernandez-Lopez J, Angelperez-Alvarez J. Tigernut (Cyperus esculentus) commercialization, health aspects, composition, properties and food applications. CRFSFS 11: 366-377 (2012). Umerie SC, Okafor EP, Uka AS. Evaluation of the tubers and oil of Cyperus esculentus. Bioresource Technology 6: 171-180 (1997). Temple VJ, Ojobe TO and Kapu MM. Chemical analysis of tigernut (Cyperus esculentus). J Sci Agric 50: 261-263 (1998). Wardlaw GM, Kessel WM. Calcium in food. Perspective in nutrition (5th ed.) 410-411 (2002). Tigernuts traders. Tigernut and health. (2005). Ndubuise LC. Evaluation of food potentials of tigernut tubers (Cyperus esculentus) and its products (milk, coffee and wine). M.sc Thesis, University of Nigeria, Nsukka (2009). Gambo A, Da’u A. Tigernut (Cyperus esculentus): Composition, products, uses and health benefits-A review. Bayero Journal of Pure and Applied Sciences 7: 56-61 (2014).